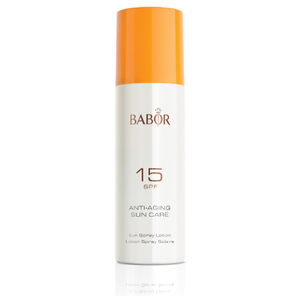 Shield skin from harmful UVA and UVB rays with the BABOR Medium Protection Sun Spray Lotion SPF 15; a fast-absorbing spray that allows you to experience the ultimate in sun protection without white marks or sticky residue. Fortified with UV filters and the brand's innovative Skin Protection Complex (SPC), the lightweight, non-greasy sunscreen creates a breathable, protective layer over the face and body to defend against sun damage and light-induced premature skin ageing. Promotes the regeneration process after sun exposure, whilst moisturising and hydrating from top to toe. Aqua, Ethylhexyl Methoxycinnamate, Dibutyl Adipate, Glycerin, Diethylamino Hydroxybenzoyl Hexyl Benzoate, Methyl Methacrylate Crosspolymer, Phenylbenzimidazole Sulfonic Acid, Arginine, Ethylhexyl Triazone, Cyclohexasiloxane, Lauryl Glucoside, Polyglyceryl-2 Dipolyhydroxystearate, Bis-Ethylhexyloxyphenol Methoxyphenyl Triazine, Tocopheryl Acetate, Panthenol, Phenoxyethanol, Parfum, Xanthan Gum, Butylene Glycol, Methylparaben, Ethylparaben, Propylene Glycol, Pentylene Glycol, Cassia Alata Leaf Extract, Cyclopentasiloxane, Citric Acid, Caprylic/Capric Triglyceride, Sodium Carboxymethyl Betaglucan, Ascorbyl Tetraisopalmitate, Tocopherol, Pantolactone, Carbomer, Dna.